"This moving story about a lady's love for her goose will touch you." 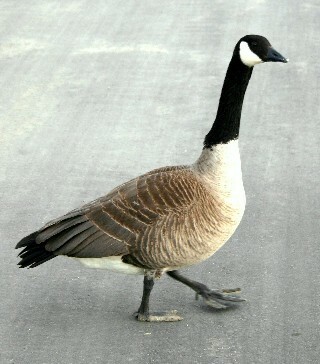 Canada geese cross busy streets in the spring and summer. In spring, parents walk their young from nest sites to brood ponds. This is a very dangerous time for them. In summer, families begin wandering away from ponds, crossing busy streets, when the goslings are about 2 months of age. 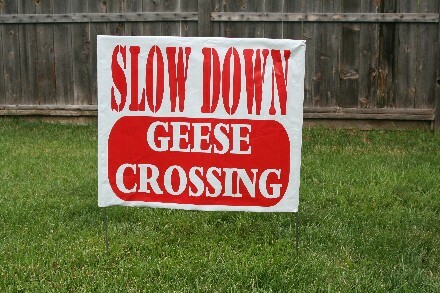 It is a very good idea to alert drivers to slow down for the geese at these times of the year. 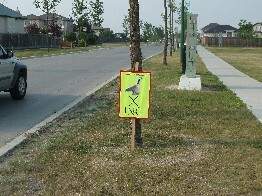 We used to make our own geese crossing signs (see below) but this summer we decided to order 100 double-sided polybag lawn signs because we need a lot of signs and it was much cheaper to purchase the minimum 100 than to purchase single signs. The cost for 100 signs was Cdn $450, which included tax and shipping. 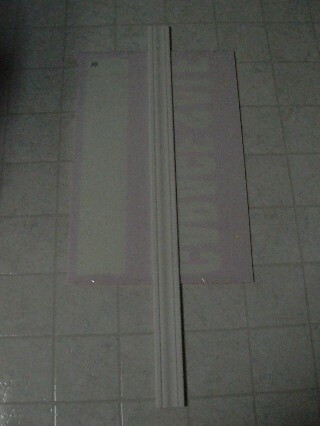 The signs are highly visible and easy to assemble and instal. You just slip the plastic polybag cover over the U-shaped wire stand. That's it! If you live in Canada and would like to purchase the signs, please visit YARD SIGNS CANADA. 1. 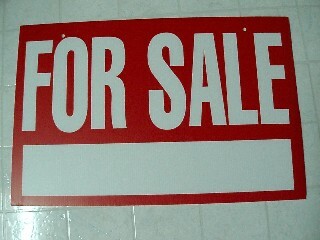 Purchase a GARAGE SALE or FOR SALE sign. We get ours from a dollar store and it measures approximately 23 inches long and 15 inches wide. 2. 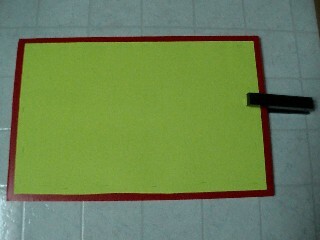 Cut a bright yellow poster board in half and staple it around the colored side of the GARAGE SALE sign, leaving the red edges visible. Red and yellow show up very well during the day and night. 3. 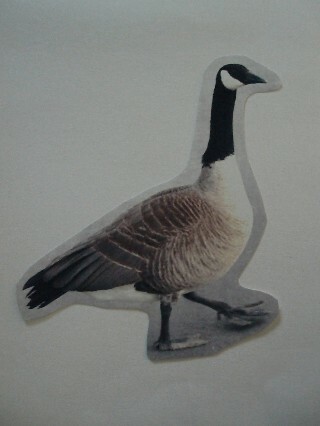 Print a photo of a goose or geese family on 8 1/2 X 11 photo paper. 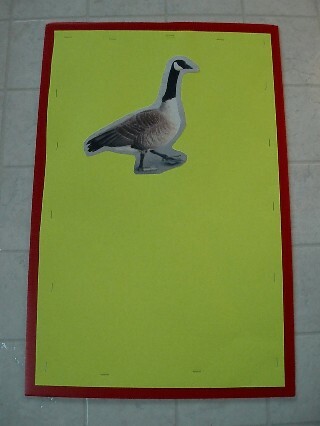 If you need a photo of a goose for your sign, please contact us at: love4canadageese@gmail.com. 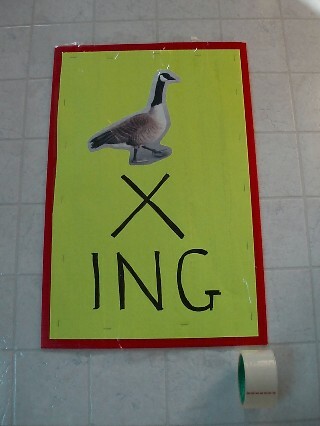 Please note that we will only allow our photo to be used for a goose crossing sign and nothing else. 4. Cut around the figure of the goose, if you wish. 5. Paste the photo of the goose at the top of the sign. 6. With a permanent black marker, write either "X ING" or "SLOW DOWN" in large letters. Both the words "SLOW" and "CROSSING" will also work well. You can use the word "SLOW" above the photo and "X-ING" beneath the photo. 7. 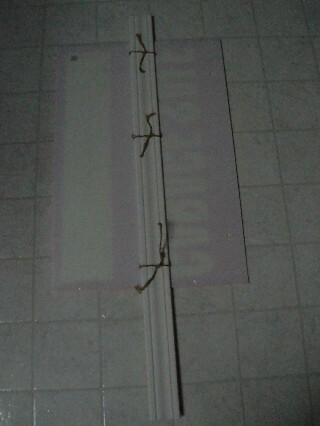 We like to seal our finished sign with packaging tape in order to "waterproof" it. It doesn't really waterproof it but it does give it a longer life, especially in areas that get a lot of rain. You could cover it with plastic sheeting, if you prefer. 8. When we made our first sign, we used the stick above but recently, we found some discarded wooden sticks with staked ends at a construction site and they were even better for our signs. Place the stick in the middle of the back of the sign. 9. Make holes on either side of the stick and thread twine through it. Thread a 2-3 foot piece of twine through the top and bottom ties. You'll use the twine to tie around either a lamp post or a tree. 10. 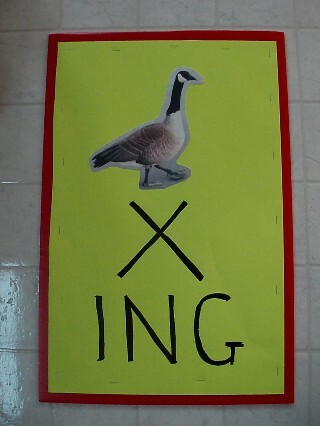 Voila - Your goose crossing sign at work!